BelleJouJou is a company that makes handcrafted bride and bridesmaid bags. These customized pieces are beautiful handbags that will be an accent piece for a bridal party. Lately we have been seeing a trend of handbags replacing bouquets. Brides can gift their bridesmaids with a handbags that can be a keepsake. You can even have a message sewn into the bag. How cute. If you want to see more from BelleJouJou make sure to visit her on Etsy store to see even more handbags and other accessories that can be made to add extra flavor to your wedding day. The Fabulous Vendor for Friday goes to Artistic Aisle Runner. We have had the lovely pleasure of working with this company several times for events that we have produced or been apart of. We always love the detail and professionalism of Artistic Aisle Runner. These aisle runners are hand painted one of a kind aisle runners that can be used to personalize the wedding ceremony. The fabric that is used has a rubberized backing that allows for no slips as the bride takes her walk down the aisle. Artisitic Aisle Runner also makes cute banners and signs. You can choose from a selection of fabric color choices to decorate your aisle. When personalizing your wedding, this is definitely a way that would make a statement when entering your ceremony site. Artistic Aisle Runner will work with your concept and design to come up with your one of a kind runner. Make sure to bring your ideas, monogram, and font inspirations when you have your consultation. When we saw this tablescape we just thought it was beautiful. What a nice setting that settles around wine. Additional touches that can me made are wine bottle tops that are candles. How cute are these?? 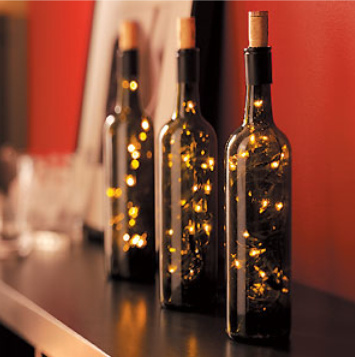 I love this idea of having the lights in the the wine bottle as well! So creative. 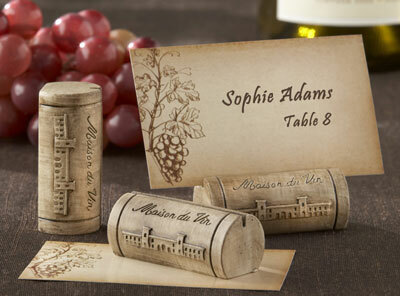 Corks, wine, and grapes are all items that can be used to add to your wine design.